Getting your family to do some exercise and get fit does not have to be hard. In fact, anyone who lives in a house has the perfect opportunity to have fun in the garden and use their outdoor space as a makeshift sports pitch, field or court. It does not matter how small your garden is, it is perfectly possible to get the children running round and getting fit in it, whatever its size. If we are being truly honest, how often does the garden get used if we do not use it for the children to have fun in? Hanging out the washing and a few barbecues a year may be all we get if we are lucky. So, achieve two outcomes in one by making good use of your garden and getting the children more active at the same time. So, what can they do in the garden? If you have a large garden, there is really very little which you cannot encourage your children to do, or, even join in with yourself. The most obvious sporty way of having fun in the garden is to start a game of football. Most children can play, and you do not need any special equipment, although if you have a large garden it may be worth investing in some children’s football posts. But if football does not capture their interest then there are plenty of other sports they can play in the garden. Cheap badminton sets which have nets that can be erected in the garden are readily available and will soon get the youngsters embroiled in active competition against one another. But even if a sport such as volleyball has captured their interest, it is perfectly possible to have an impromptu game in a decent sized garden, with the help of nothing more than your garden washing line as a net. Courts can be marked out using jumpers, much like the old ‘jumpers for goalposts’ that most children will have employed at some point during their lives. But if you have a small garden, there may well not be the space for these kinds of endeavours, especially without the risk of broken windows – both yours and those of your neighbours. But that does not mean that the garden cannot be used as a place to exercise and have fun. Think about using the space you have constructively. One popular way of having fun in the garden these days is to have a trampoline put up. There are all sizes available and therefore there is bound to be one which will fit your garden. 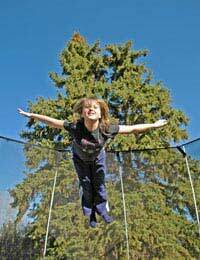 Getting the youngsters jumping up and down is a great way to get them to exercise and most trampolines available these days have safety nets if you are concerned about them falling off. If you do not like the idea of having a trampoline taking up space in your garden, then think about more retro games which do not take up too much space such as swingball. The children can run around after the ball when they are out in the garden but the game can then be stored around its pole, barely taking up any space in your garden at all. Gardens are the perfect place to make sure your children are having fun and getting some exercise, all the time being under your watchful eyes. This is ideal if you do not have time to take the youngsters to the park every day. Do not think that size of your garden has to limit their activity – there is a game for every space, and always something that will not threaten your neighbours’ windows.